Fans of Soho bistro Bob Bob Ricard will be well acquainted with its ‘Press for Champagne’ buzzer, and now Burger & Lobster has gone one better with the launch of a Taittinger Champagne train. 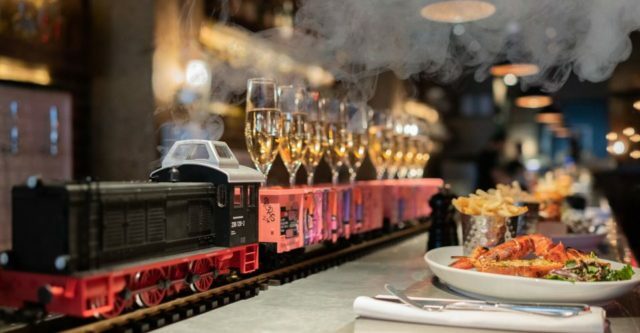 Burger & Lobster has teamed up with Taittinger to launch a bottomless brunch where flutes of fizz make their merry way to guests on a train set. The miniature railway – the Taittinger Express if you will – complete with trendy graffiti, runs the length of the restaurant’s nine-metre bar. For £25 guests get a ticket to ride the effervescent express, allowing them to pick up as many flutes of Taittinger Brut Reserve NV as they like from the train while it does the rounds. On the food front, expect the likes of a prime cut Nebraskan 10 ounce burger, wild Nova Scotia lobster, or both if you’re feeling greedy and indecisive. Starters on the à la carte menu include lobster croquettes, Norwegian king crab and rock oysters in a Bloody Mary sauce. The bottomless brunch deal is due to run for three weeks from 29 March until 14 April at Burger & Lobster in Soho.